Just recently, Yayoi Kusama jumped off the page of a magazine and got my attention. Kusama released Happening in 1965. Since 1967 she had a lot of happenings and fashion shows not only in New York but also in Holland and Rome. As she got more active , she was influenced by an anti-vietnam war movement and American Presidential election and social elements were added to her art. 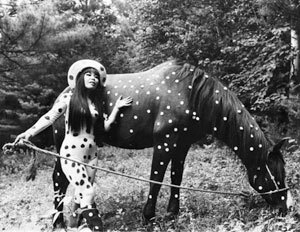 She started creating Kusama Dress and textile , which were sold at department stores and boutiques all over the United States. In 1969 she opened her own boutique. This entry was posted in Conversation and tagged artists, carol naff, marketing, marketing coach, marketing ideas, marketing strategies, nature of the universe, polka dots, positive thinking, public relations, social elements, social media by Carol Naff. Bookmark the permalink.